What do you put in a 21st century time capsule inside the cornerstone of a 19th century landmark that’s undergoing restoration? 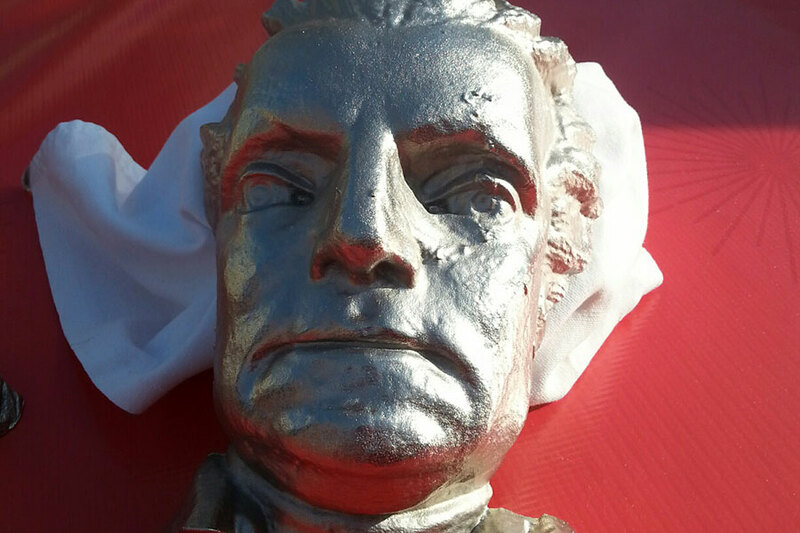 If the landmark is the nation’s first monument to George Washington, you put in a 3D printed likeness of the first president, hot off the 3D printer, of course. That’s the idea behind the four shiny objects that will be sealed within an 1815-era cornerstone and placed below the base of the Washington Monument in Baltimore, Maryland, home of the aforementioned first monument to Washington. The city-owned monument, designed by Robert Mills as a centerpiece for Mount Vernon Place, is undergoing a $5.5 million restoration that’s nearing completion. Planners say this is one of the first instances, to their knowledge, of 3D-printed objects being placed in the cornerstone of a restored monument for future generations to discover—and the objects actually mirror elements of the monument itself. The restoration work will be complete and the monument will reopen to the public on July 4, 2015, exactly 200 years after the cornerstone was laid to signal the start of construction. It has been closed for repairs since 2010. 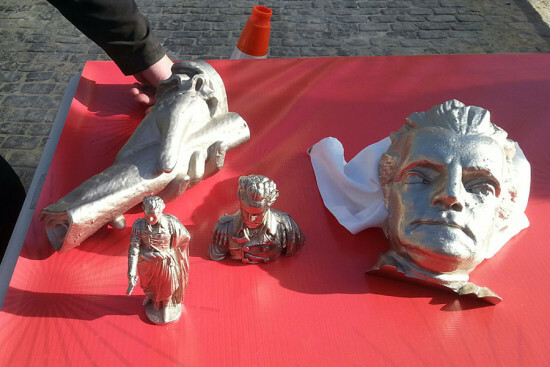 The four objects, displayed publicly for the first time during a media event Sunday, April 12, include a mini bust of Washington, a mini statue, a mask-like reproduction of the face on Washington’s statue, and a life sized replica of one of his hands, holding a scroll. All four objects were made with 3D scanning and printing technology by Maryland based companies whose principals specialize in the process and wanted to apply it to historic preservation. Noting that time capsules and cornerstones often contain newspapers from the day they were sealed, Humphries said 3D printing is essentially a 21st century way to impart information that was previously conveyed in print form. He said the conservancy’s goal, in placing miniature replicas depicting pieces of the statue inside the cornerstone, was to leave behind information that could tell future preservationists about the statue’s condition after 200 years. 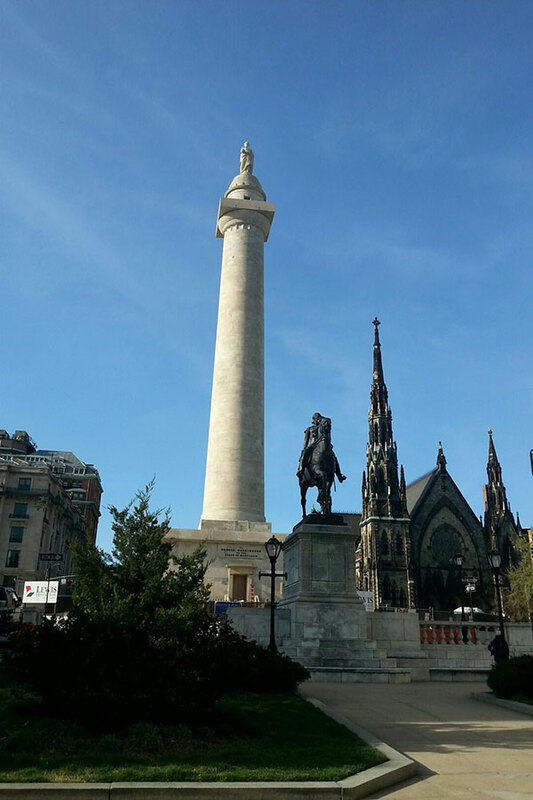 Unlike Robert Mills’ Washington Monument in the nation’s Capitol, which is a marble clad obelisk, Baltimore’s 178-foot-tall monument is a classical Doric column atop a stone base, with a larger-than-life statue of Washington at the top. The standing figure, by Italian sculptor Enrico Causici, depicts Washington resigning his commission as Commander in Chief of the Continental Army in 1783. 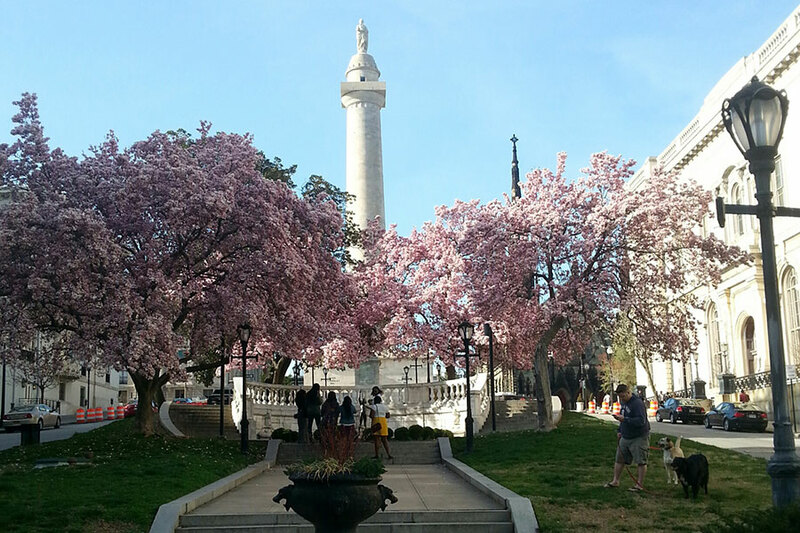 For years, visitors could climb to the top of the Baltimore monument and enjoy unobstructed views in all directions. But the monument was closed to the public after Humphries, from an outdoor café a block away, noticed imperfections in the stonework near the top of the monument and reported what he saw to city officials. That triggered a chain of events that led to the current repair effort. 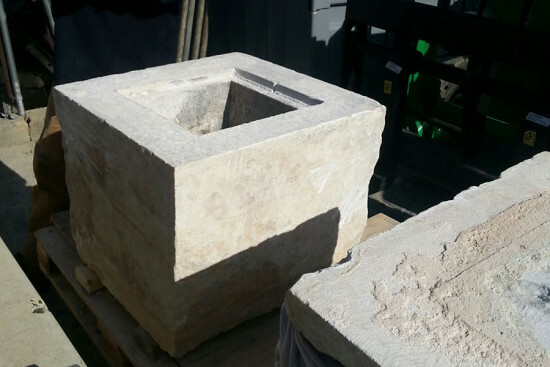 During the restoration, workers discovered the 1815 cornerstone, with contents from that year, and a second time capsule from 1915. The 1915 time capsule has not been opened but will be soon. The 1815 cornerstone was opened in February. Its contents included newspapers from 1815, glass jars, coins, and a likeness of Washington. As part of activities leading up to the 200th anniversary of the cornerstone laying in July, conservancy members wanted to re-bury the 1815 cornerstone, again with objects that might send a message to future generations. Museum conservators recommended that they not re-bury the fragile artifacts from 1815, to ensure their preservation. That’s when Humphries came up with the idea of turning the 1815 cornerstone into a time capsule containing miniature versions of parts of the Washington statue, made with 3D printing technology. While scaffolding was still up around the monument, Washington’s statue was documented with 3D scanning technology by Direct Dimensions of Owings Mills, Maryland. A digital scan was taken to create a record of the statue’s condition in 2015. The same scan was used to print the miniature 3D images of the statue that are going in the cornerstone. The four objects were printed in nylon by NextLine Manufacturing of Gaithersburg, Maryland. Then, to ensure that they would last, the 3D models were electroplated for durability, first in copper and then in nickel, by a Halethorpe company called RePliForm. Although the coatings give the objects a metallic appearance, the figures are relatively light, as if they were made with plastic. One of the four objects, the hand, is hollow in the middle and will contain a handwritten letter, like a message in a bottle. The letter, written in English, will describe the restoration project and the statue’s condition at the 200-year mark. Whoever finds the four objects, Humphries said, will be able to compare the condition of the statue in 2015 and the condition whenever they next open the cornerstone, showing how much the statue has eroded or otherwise changed over time. In that sense, he said, the 3D images will provide useful information to conservationists of the future. Humphries added that conservators advised his group not to include newspapers this time because most newspapers printed today are “so acidic” that they might damage other objects stored with them. The monument will reopen during a daylong “Monumental Bicentennial Celebration” that will include a Naturalization Ceremony, a formal ribbon cutting, and a “family friendly” fair. Admission is free. As exhibited Sunday, the mini-statue of Washington is reminiscent of similarly sized replicas of the Statue of Liberty that are sold to tourists in New York City. Conservancy representatives say their organization may eventually fabricate and sell copies of the cornerstone objects as souvenirs, to raise funds for additional phases of restoration work around Mount Vernon Place.